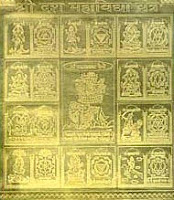 There are various ways this devis worshipped with the prescribed mantra and yantra . They are worshiped as the remedial astrological measure and they also worshipped by the tantrik for to attain various types of sidhis and for spiritual salvation . Some of this Devi is very powerful and dangerous and must worshipped in guidance of the spiritual guru. GODDESS MAHAKALI is the mosty superior among the ten mahavidyas of tantra , which give immediate result to her sadhak , She can give her sadhak everything which is necessary to live in this world , it give protection from bad influence of planet Saturn , and can fulfill all desires of human She give name fame , money prosperity to her sadhak . Whatever he wishes is fulfilled, for he is bestowed with 64 divine virtues ( CALLED 64 Yogini) which help him succeed in every venture that he undertakes. He becomes a virtual Man of his Age. This Sadhana can be started on first day of any month. Ma BAglamukhi , who is called the terror to the enemies , In this present age it is called that maa baglumukhi can fulfill all the desires , It also called Pitambara Vidya , give protection from all enemies and defeat them ,She give victory in all types of legal matters , court cases and clear all the bad influence of planet MARS and clear away the debts . She clears all types of tantra mantra and any sort of black magic effects She Give total protection from all evil planet and evil power in this world. It good if this sadhna is done in guidance of spiritual GURU. MA Tara its called the Goddess which give all round prosperity to the worshipper , She give power of speech , pleasure and salvation , she also worshipped for the destruction of enemies in tantrik method .It remove the malefic effects of planet JUPITER . IT should be worshipped by businessman for expansion of business and name and fame . Dhumavati is the smoky form of Shakti. She is also known as the eternal widow, the Shakti without Shiva. She is ugly and also called Alakshmi, the one who is without Laxmi or radiance. Goddess Dhumavati give total protection to Her worshipper from any sort of black magic , all types of court cases , protection for the wealth and protection form enemies. It neutralize the effects of Planet Rahu . Dhumavati is the Divine Goddess at the time of the deluge, when the Earth is under water. While being ugly and fearsome, she is blessing with her right hand those who can still see the Divine Mother in her. The black crow on her flag is the symbol of dark forces and black magic. The Sadhana of this Mahavidya can be done on any moonless night after 10 p.m take a bath, wear black robes and sit alone in a room facing south on a black worship mat. Before yourself place a wooden seat coverd with a black cloth. In a steel plate place Dhoomavati Yantra. On one side place the picture of the Goddess. Next it in another plate place yantra and Dhoomavati Mala. Goddess Chhinnamasta is a symbol of the perception of secrecy. She stands on the seat of white lotus. In her navel Yoni Chakra are situated. The directions itself are her apparel. Her two companions symbolises the two qualities of Tara (dark) and Raja (medium). She is alive even though her head is severed from her body. Shodashi, who has the mantra consisting of sixteen letters, has organs glowing like a rising sun. She has four hands and three eyes. She is seated on the lotus, which is placed on the body of Shiva who is lying in a peaceful posture. She has a noose, a hook, a bow and an arrow in each of her hands. Eveready to shower blessings on her devotees, her appearance is completely Sombre & gentle and her heart is full of compassion. MAnTRA :_ Om Aim Hreem Shreem Sri Lalita Tripurasundari Padukam Poojayami Namah"
MANTRA : "Ka E i La Hreem - Ha Sa Ka Ha La Hreem - Sa Ka La Hreem"
Lord Shiva is also known as Matang. His Shakti (power) is called Matangi. Her complexion is dark and possesses a moon on her forehead. The three-eyed goddess is seated on the crown decorated with jewels. Her lustre is like a blue lotus and is destroyer of the demons (forest) like a fire. In each of her four hands, she has a noose, a mace, an axe and a hook. She is a destroyer of the demons by enchanting them first with her beauty and a fulfiller of every desire of her devotees. She is worshipped for the attainment of great powers, power of speech, happiness in family life etc.